Like any other program, Doctor Who is a show that relies heavily upon fan interest. Doctor Who faced cancellation twice in 1989 and 1996. However, it is no doubt the fans that played a major part in giving the show new life in 2005. Leading the charge on fan enthusiasm is Doctor Who Magazine. Since 2010, the monthly magazine has been acknowledged by Guinness World Records as the longest running sci-fi magazine in history. There is a lot for Doctor Who Magazine to be proud of, including themselves and their staff. Part of the staff is Editorial Assistant, Emily Cook who has kindly agreed to an interview about her dream job, her charity and the fan-favourite magazine! Do you remember the moment you became a fan of Doctor Who? Did any particular episode leap out at you? Yes, vividly! As a kid, my parents had tried to get me to watch some classic Doctor Who. They showed me ‘The Ark in Space’ but the alien was clearly made of green bubble wrap and, as I was young and undiscerning, I wasn’t impressed! So when they told me that this old show, Doctor Who, was coming back, I wasn’t interested. Nevertheless, I reluctantly sat down to watch ‘Rose’ in 2005 (I was 11 at the time) and I’m so glad I did because from that opening scene onward, I was hooked. I could not take my eyes off the screen. I have been a big fan ever since. As for your job let’s start with what your role at Doctor Who Magazine is. Talk us through your day-to-day, what types of things you find yourself doing for the magazine? I am an editorial assistant for the magazine which means I get to do all sorts of different jobs! I often prepare the emails/letters’ for Galaxy Forum; I read through features and interviews and make sure the text is consistent with the magazine’s house style; I write press releases for each issue. Oh, and I do a lot of proofreading! I have also written some features for the Doctor Who Magazine Specials, which I really enjoy doing. I love how varied my work is. 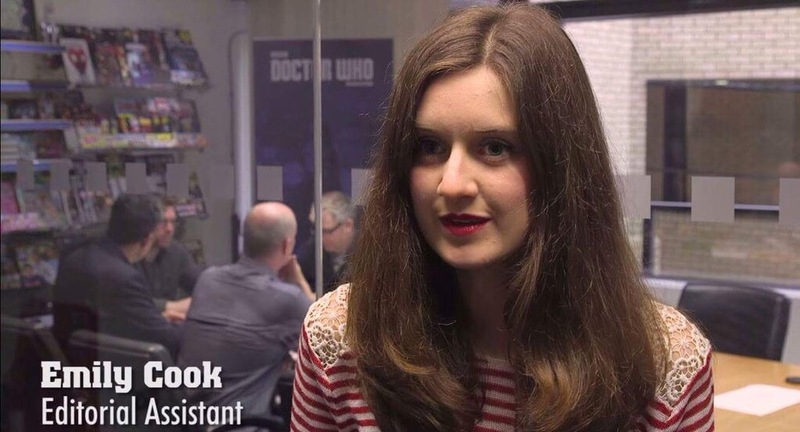 On top of my role at DWM, I am also the editorial assistant of Doctor Who – The Complete History. You told us you are fresh out of University before we started. How special do you feel to land, what would be to many, a dream job working for Doctor Who Magazine? How did you get that start? What advice might you pass on to others? Well, first things first, I want to clarify that I’m no more special than anyone else reading this! But yes, I did start this job straight after university; it is something of a dream job for me, so I do consider myself very fortunate and I don’t take it for granted. Emily Cook and the Stars of Doctor Who! Growing up, I had always wanted to be a teacher, but I was inspired to start pursuing this field of work during my time at uni. I studied English Language & Linguistics at the University of Kent and one of my modules was Writing in the Media. For our coursework, we had to put together a magazine portfolio. The magazine could be about anything. Doctor Who had always inspired my creativity as a teenager, so, of course, I wanted to incorporate it into my coursework. I happened to know of someone who worked for Doctor Who Magazine so I asked if he knew of any actor from the series who wouldn’t mind me interviewing them. He was very helpful and put me in touch with Louise Jameson (Leela), and Louise very kindly let me interview her. From then on, I got the bug for magazine work. 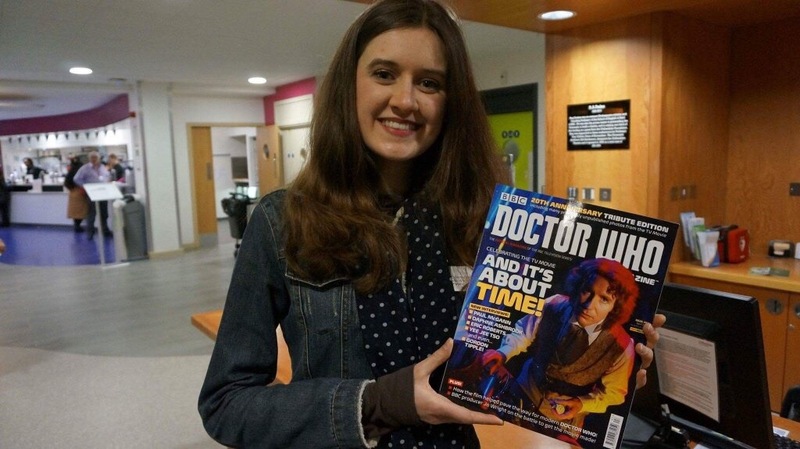 I managed to get in touch with and interview Sophie Aldred (Ace) and Caitlin Blackwood (young Amelia Pond) which helped me build up my portfolio further. I wondered if I would enjoy making a career out of this sort of work so I cheekily asked my contact at DWM if I could come in for some work experience. I was over the moon when they said yes! 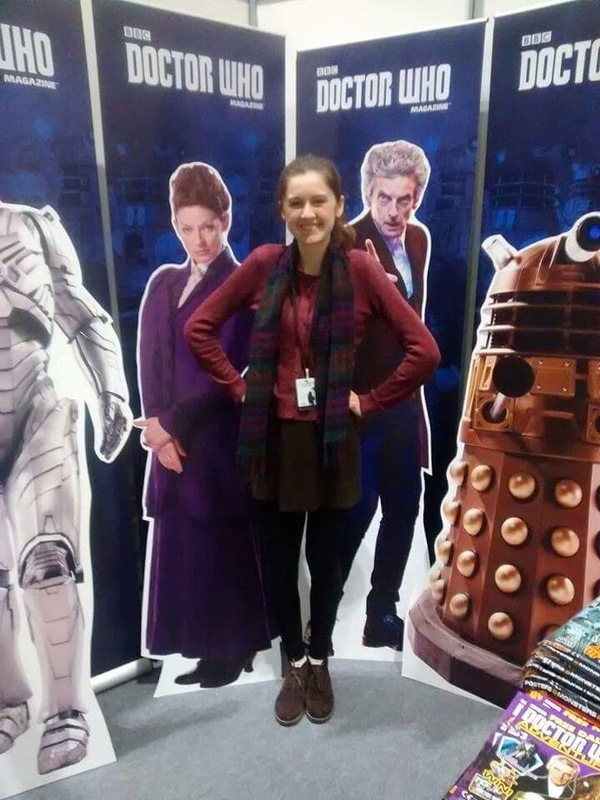 So I went into the DWM office for a week – and loved it! – then went back to uni to do a Master’s degree in Linguistics. About half a year later, they got back in touch with me and offered me a job! I’m aware this might make getting a job sound very easy, and maybe it was partly the case of being in the right place at the right time. But, my advice to anyone – whatever it is you want to achieve – would be these three things: 1) Work hard, 2) Be passionate, 3) Seek opportunities. When you do these three things, amazing things happen! But most importantly because we are all unique individuals, everyone’s route into what they do is different. So do what works for you rather than what worked for someone else. From the looks of your Twitter cover photo, Doctor Who Magazine landed a Guinness world record! Explain to us how surreal that must be, and how that day was? For a number of years now, Doctor Who Magazine has held the Guinness World Record for the longest-running TV tie-in magazine. As part of the celebrations for Issue 500, this award was reissued to DWM. 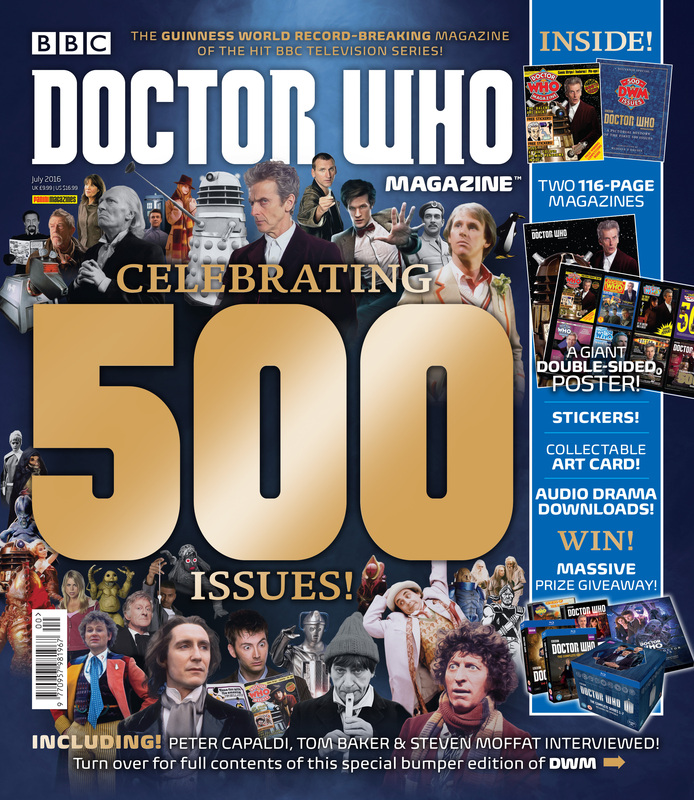 It was a huge honour being part of these celebrations as a member of DWM’s current editorial team (and what a superb team it is – seriously, the guys I work with are amazing!). And it was really quite humbling to meet people who worked on DWM in the early days… people who’ve been reading and loving it since Issue 1 in 1979… and people who’ve been working on it for a lot longer than I have! My contribution to the magazine is a teeny tiny drop in the ocean, in comparison. I mean 200 issues were published before I was even born! And I have worked on just 2% of the total number of issues! DWM has a rich history and a superb reputation – it’s such a wonderful thing, and it’s an absolute privilege to be a part of it. Speaking of Twitter, many of your followers will note that you spend time with the stars of the show. What’s that like for you? Is it thrilling? Everything about my job thrills me! But yes, I have been lucky enough to meet some cast members from the series. Last year, I interviewed Ingrid Oliver (Osgood) and Michelle Gomez (Missy) at the Doctor Who Festival. I met Sylvester McCoy (Seventh Doctor) when we were at ComicCon. 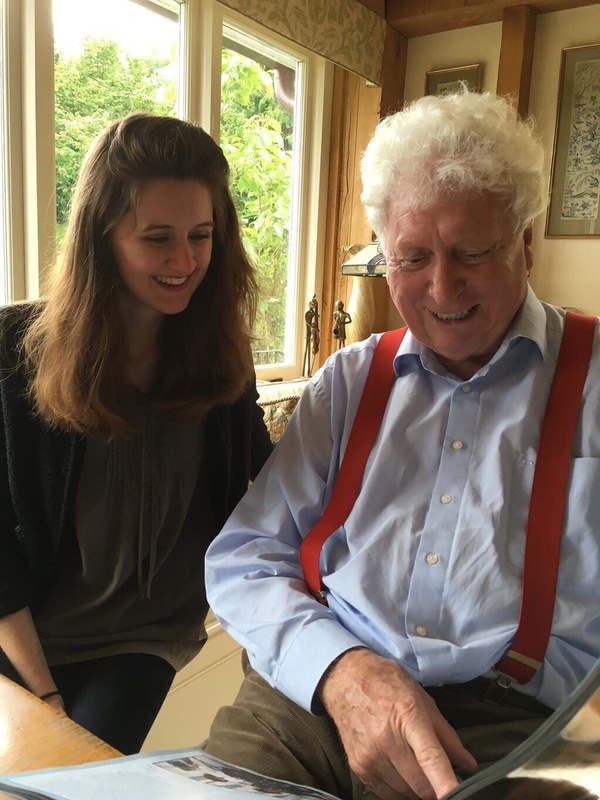 Most recently, we visited Tom Baker to give him copies of the Fourth Doctor special (DWM 501) – that was very special. For me, meeting these people is very exciting, but as it’s all connected to my job, I obviously have to maintain a level of professionalism. It’s okay to enjoy yourself and be professional at the same time, though! What has challenged you most in working for Doctor Who Magazine? For a start, with this being my first proper job, the adjustment from being a student to working full-time was initially challenging. DWM is such a high-quality product so I’m very conscious of wanting to do a good job. Although I’m constantly learning new skills, there’s always the fear that I’m not good enough to be here – at the back of my mind, I’m often thinking, ‘Oh gosh, when are they going to find me out? !’ (I think self-doubt is a common feeling for most people in life.) Also, working for DWM has inevitably changed my relationship with Doctor Who. Doctor Who used to be my means of escapism and unwinding from a hard day’s work. Now it’s become my job, it can’t quite play that same role in my life. I love Doctor Who and always will, but I think it’s important to make sure there are other things in my life too. Tell us more about your charity work. How did that all come around, and what do you strive to achieve? I run a charity called Khushi Feet which raises money and awareness for schools for children living on the streets of Kolkata in India. I was inspired to set up this charity after I visited these street schools in 2011. I noticed that the volunteer teachers ran the schools with such limited resources, yet the street children were so excited to have the opportunity to go to school. I wanted to do something to help! Would you consider Doctor Who a good catalyst for global or social issues today? Most definitely! Doctor Who deals with so many humanitarian issues in very clever, creative and sensitive ways. One example which immediately comes to mind is in Planet of the Ood when Donna is appalled that humans in the future are captivating the Ood in slavery. “A great big empire built on slavery,” she says, disgusted. “It’s not so different from your time,” replied the Doctor. “Oi! I haven’t got slaves,” Donna snaps. The Doctor simply replies: “Who do you think made your clothes?” Very thought-provoking! And of course, last series we had the Doctor’s spectacular speech at the end of The Zygon Inversion about the terrible consequences of war. I think the Doctor demonstrates what it is to be a good global citizen. Doctor Who may be fictitious, but it can teach us so much about the real world in which we live and how we can make it a better place. Finally, what can readers expect to discover in the next or most recent issue? Any teasers? Do you really need teasers?! Surely you all know the DWM never fails to deliver and is always awesome! But if you would like something to whet your appetite… the much-anticipated results of our latest Season Survey will be revealed in the next issue! You can find more information on Doctor Who Magazine at their web pages, on Twitter and on Facebook and for more information on Emily’s charity Khushi Feet, check out the official website. George is an English Literature graduate writing and editing frequently for multiple outlets and agencies, such as York Calling, WMG, Inspiring Interns, and more. Other activities and interests include hiking, travelling and avidly attending West End Theatre and Comic Cons in both guest and press capacity. Doctor Who Magazine Issue 536 – There ARE such things as Macra! What a great read! Thank you for this! I always enjoy checking out this site every day,but I really don’t comment enough,lol. You should comment more! Definitely! Discussion is always better than none! I for one would love to hear from you or anyone else. Even if its criticism! Oh,ok. I sure will George,and thanks again for the article. And I must say that I love how DWM is made with such care and love. It really shows. I buy mags like SW Insider and ST Magazine and similar stuff,but they often end up feeling like they were just slapped together with some pics and soundbites and press releases. Not so with DWM. It’s always an interesting read. Don’t get me wrong though,I love those other fan magazines as well,but the difference is just so…..,clear,if that makes sense. Everyone at DWM is a huge fan of the show and have a real passion for what they do, which is great to see. Everything Doctor Who is done with a sense of fun and passion, from the show to fan projects to magazines. Full of optimism and care! In my humble opinion, there’s not many fan bases that can rival those of Doctor Who. Maybe Star Wars and Star Trek. I can’t think of any more…. Terrific interview. Great to see the passion that “Doctor Who” and the magazine engender after so many years … and brilliant to read about the inspiring work in Kolkata. Thanks Andrew, its wonderful to hear from you! We’re all huge fans of the magazine and many of its staff. We’re looking forward to reading your work with locations! I love to see people having *fun* with this programme (or any other), being delighted by opportunities when they arise, and adopting a positive outlook on life and careers. And while I also strongly believe in people putting programmes that they adore first before themselves, it also makes me extremely happy when I see people directly tackling real-world issues in the way that Emily has the drive, determination and energy to do. And being able to see these qualities displayed here is a real tonic! And I hope that you’ve had fun doing it as well. I think sharing the enjoyment rather than owning it is very important. And “DWM” has had so many very, very amazing people on its staff over the year. It’s always a delight to see their many talents being appreciated. re: the locations. Very little from me in the Special Editions …. which have been a wonderful opportunity for voices which are comparatively new to the “Doctor Who” magazine culture such as Chris Bentley, Matthew Kilburn, Jonathan Rigby, etc. to shine and to offer fresh, new perspectives on this material. Haven’t had chance to read all the finished product yet, so I’m looking forward to it as much as you are. All I so is simply return to my beloved Portmeirion. Yet again. But thanks again for this excellent chat with Emily. Always nice to read about the people who work on “DWM”, especially when they seem so delighted by the opportunities they have and when they have such a wonderful perspective on life. Articles about DWM sure do seem to bring out the commenters! Emily was amazing to interview and gave better answers than I could have hoped for. Very generous with her time, also, as is further evidenced by her charity work. But yes I completely agree with you. Doctor Who is backed by the kindest and most generous of fans. Of course, like Doctor Who Magazihne, Blogtor Who does pride itself in sharing the enjoyment of our experiences. At London Film and Comic Con I was lucky enough to interview Sylvester McCoy, Paul McGann and Lee Sullivan. They all gave delightfully funny interviews! They’re up on the sight if you’re curious! But on the subject of the DWM staff, I have to agree. Hopefully in the future I will be able to sit down with a few more staff members and contributors and share more of their hard work here! I also love how DWM brings fresh faces into the fold! Emily even said during the course of our interview that she was fresh from University when she landed the job. It very much sounds like a great opportunity, and should be commended for their effort to display new talents. Your own talents are to be celebrated too, regardless of the size of your contribution! You all do a truly wonderful job! Thank you for reading it! We don’t usually get too many comments, and it’s always delightful when someone takes the time out to leave a message. I really appreciate it. Thanks for stopping by! You are always welcome! Nice to hear people of commenting (hopefully positively) about “DWM”. But – then again – nice to hear of people commenting (hopefully positive) … about anything. I’ve never met Emily, but from reading her words online and in magazines she strikes me as capable and communicative. I did indeed read the chats with the other guests at LFCC. All good fun … but this was the one that caught my eye in particular because of Emily’s comments about her work in Kolkata. It was something a bit different and it offered a superb contract between two elements of her life. It also was nice seeing Lee’s comments as well – haven’t seen him in years! Nice fella! I think “DWM” benefits from fresh perspectives ,,, *especially* on older material. But that’s true of any sub-culture, particularly those which exist on a very small pool or finite amount of original work which is studied and studied again repeatedly. You need new takes on things … honest takes, particularly from people who put the subject matter first and themselves second. I don’t often comment much on stuff I see online … and when I do it’s generally a quick “Gosh – that was nice!” type of thing whenever I happen to read something and think “Gosh – that was nice!” Always happy to chat to people who enjoy all these amazing programmes when I get a moment … and a pleasure to see so many people getting a kick out of the shows online. DOCTOR WHO: Demons Of The Punjab – Who Is Hamza Jeetooa?